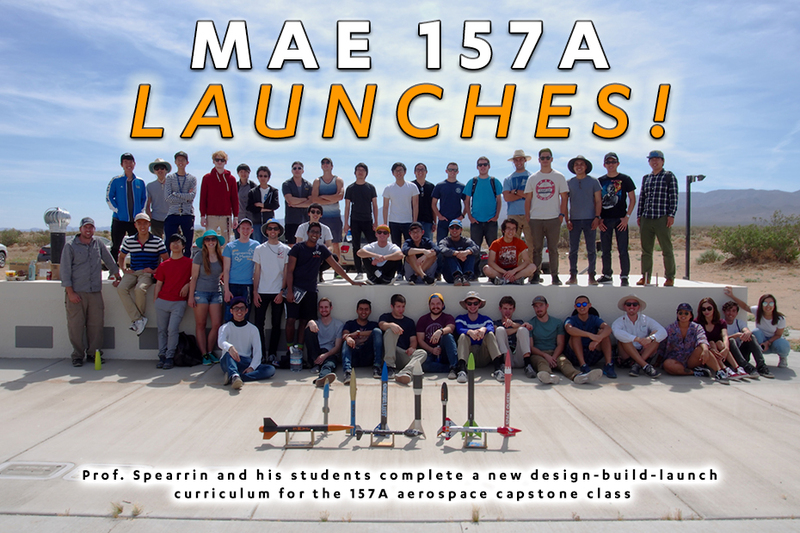 UCLA MAE Assistant Professor Mitchell Spearrin and his students recently completed a new design-build-launch curriculum for the 157A aerospace capstone class. 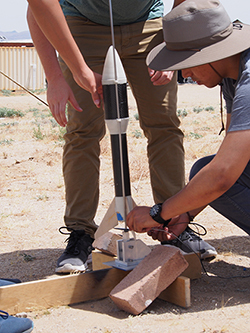 The team-based course involved the development of student-built rockets and culminated in a launch competition in the Mojave desert. 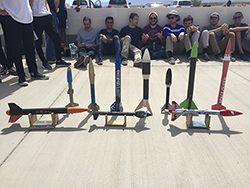 A series of structured labs, each focused around one component of a rocket, were conducted in parallel to the team design project, and covered a range of analytical tools, aerospace materials, manufacturing techniques, and testing methods. The class was taken by approximately 45 AE majors in their senior spring quarter. This article summarizes interviews with Prof. Spearrin and three of his senior students: Sam Dupas, Sean Missimer, and Janelle Rogers. Wind tunnel stability and drag testing. 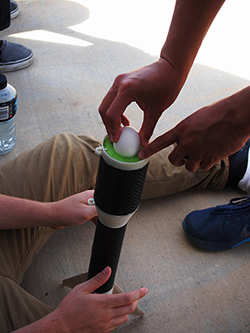 Team Sputnik loads egg payload in rocket. Recovery of an unbroken egg was a competition metric. TA Fabio Bendana readies rocket for launch. Sean Missimer and Team Rocket JAMS. 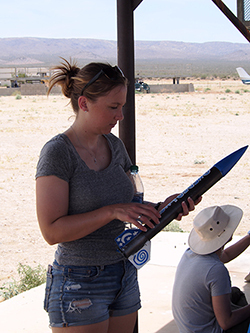 Janelle Rogers with the Team Blue Wake rocket. Prof. Spearrin likens the teamwork element to industry as well, and sees it as part of a broader skillset needed by engineers. “In this class, the hope is that the students get to exercise and strengthen their engineering skills. Engineering skills complement the foundational knowledge that we primarily aim to instill in students in their undergraduate courses and are increasingly expected by industry employers. These engineering skills include technical ones like proficiency in common computational tools (for example CAD, CFD, Matlab, and FEA), an understanding of manufacturing processes, and competence in testing methods and measurement techniques. But equally important are the skills of effective verbal and written communication, project management, and team interaction which are part of an engineer’s day-to-day job. These social engineering skills don’t as easily transfer to your resume but can be as significant to job success.” The value of team-based student design projects is well recognized by industry recruiters. “This new aerospace capstone curriculum responds to a need identified by our Industrial Advisory Board (IAB),” added Christopher Lynch, MAE Chair. Sam Dupas in the launch observation bunker. RRS Beta 2 Rocket launches! 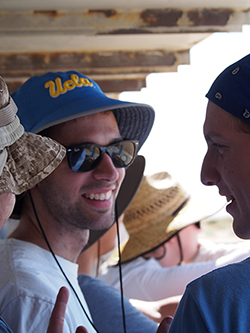 Prof. Spearrin hopes to continue the design-build-launch curriculum for years ahead. “We can change the mission objectives and competition criteria to make it a unique experience while using the same approach. This is the way most companies go about developing new products. The process is about the same, while the final products differ.” He pointed out that there were a number of major contributors to the new curriculum. “The TAs, which included graduate students Fabio Bendana, Yi Yan, and Huy Dinh, did a phenomenal job developing and vetting the labs and supporting the student teams in what was a fast pace project. 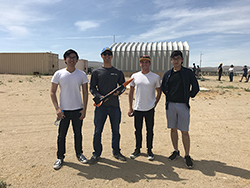 Ben Tan and Dirk Williams on our engineering staff were also very helpful.” The final competition launch was facilitated by volunteers from the Reaction Research Society (RRS), the oldest amateur rocketry organization in the United States. 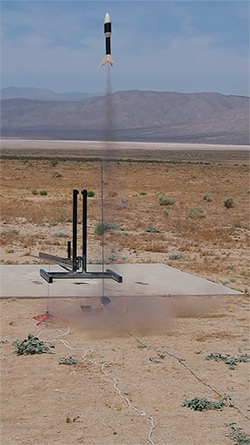 “They hosted us (at their Mojave test area) and were kind enough to demonstrate the launch of two high-power zinc sulfur rockets,” added Rogers. The RRS has also supported the Rocket Project student club this year.